The Miami New Times column Riptide reports that Mr. Clucky, the venerable mascot of South Beach, must leave his home. Mark Buckly, his human companion, was given a citation by the City of Miami. The reason: The city prohibits "the keeping, stabling, or maintaining of livestock." Well, I had to wonder why Mr. Clucky has to go, while Polly the Parrot and Fred the Cockatoo get to stay. They're all birds, after all. They all have feathers, they all make noise, and they all perch on their human's shoulders. Hmm. "Animals kept or raised for use or... pleasure." But wait, isn't "pleasure" why we keep dogs and cats? We don't call dogs or cats "livestock." We call them "pets." So what is the definition of "pet," pray tell? Well, as personable as Mr. Clucky is, he's neither a spoiled child or a person. But what he is, without dispute, is a domesticated animal. And since you can't get eggs from a rooster, he's obviously being kept for pleasure rather than utility. Mr. Clucky is a pet. Just as a parrot or cockatoo is considered a pet. Once again, we discover that we only think we understand our own language, but we really have no clue at all. 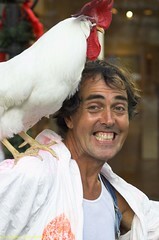 The City of Miami Beach is dead wrong: Mr. Clucky is not livestock, he's a pet. The definitions are quite clear. He's a pet, therefore it's not illegal for him to be in Miami Beach. Interestingly I would imagine that an apt euphemism for whomever lodged the complaint would also be a synonym for rooster. i see this guy all the time on Lincoln Rd. to me, riding around with a freakin' chicken on your handlebars, is a cry for help! Why I Don't Use Norton (Or McAfee). Is Fox News Helping Monsanto Give You Cancer? The prickly pennings of a man who reads a lot. "Well, now we'll see if I am a Man - OR A MANIAC!"